Travel on India's extensive rail network from buzzing Kolkata in the East to Amritsar's Golden Temple. On the way we delve into India's melting pot of religions including Hinduism in Varanasi and Buddhism in Bodh Gaya as well as sailing along the Ganges and riding the iconic toy train to Shimla. Our tour begins this evening in Kolkata. Once the capital of British India, Kolkata (Calcutta) has had a turbulent past. It was central to the struggle for Indian independence and thousands of Bengali refugees came here at the start of the 1900's. It is a city of striking contrasts and can be overwhelming initially, but the unusual sights, pungent smells and the chaotic sounds of the country's second largest city are an experience unique to India. This morning we'll begin our exploration of Kolkata with a visit to the colourful flower market and the clay modeller's village. The potters here spend all year creating a wealth of images and idols for the annual festivals and, as the time approaches for the models to be prepared for the coming pujas, the streets are filled with an overwhelming display of brightly coloured and richly attired idols. We'll also visit the Victoria Memorial, Dalhousie Square and Kolkata's wonderfully intricate Jain temple, an important pilgramage site for Jains from all over India which set in particularly beautiful gardens. A free morning affords an opportunity to explore a little more of the city. You may wish to travel to the Dakshieswar Kali Temple and the Ramakrishna Mission or perhaps visit the Mother Theresa Home and Orphanage. This remarkable woman, born in Serbia in 1910, has become synonymous with the city of Calcutta. A member of the Order of the Loreto nuns, she was sent to India in 1937 and spent the next 60 years attempting to alleviate some of the appalling poverty that first assailed her on her arrival here, self sacrificing acts that saw her beatified by the Vatican in 2003. Transferring to the railway station later this afternoon we then continue our journey by train, heading for the important Buddhist pilgrimage site of Bodh Gaya, in the Bihar province on the plains of the eastern Ganges. It was here that the Lord Buddha attained enlightenment, making the town an important mecca for pilgrims from across India and the rest of the Buddhist world. This morning we will join the constant flow of the faithful to visit some of the most important sites in the Buddhist world. Whilst the original Bodhi tree under which Prince Siddhartha Gautama achieved enlightenment over 2600 years ago no longer remains, its ancestral descendants still occupy the same spot and we will visit it, along with the majestic Mahbodhi Temple this morning. Built in the 6th century AD on the site of an original temple erected by the emperor Ashoka in the 3rd century BC, this magnificent building, topped by a towering 50m high spire, was declared a World Heritage Site in 2002 and is one of the oldest brick built Buddhist temples in India. We will also visit the 25m high Great Buddha Statue, before taking an early afternoon train east, towards the holy city of Varanasi, certainly one of the oldest Hindu pilgrimage centres in India and believed to be one of the oldest continuously inhabited cities on earth, its age making it a contemporary with ancient Thebes and Babylon. Lying on the banks of the sacred River Ganges, Varanasi is steeped in the lore and traditions of Hinduism, and since its inception as one of the principal centres of Shiva worship some 1200 years ago, it has attracted devotees from across the world to its myriad of temples and ghats. It is believed by many that this is where the material and spiritual worlds cross and countless thousands come here to cleanse themselves along the banks of the Ganges and partake in the rituals of Aarti. On arrival in the city we will transfer to our hotel, where we will spend the next two nights. This morning we make a short journey north, to the sacred site of Sarnath, the cradle of Buddhism, where the Buddha preached his first sermon following his attainment of enlightenment. We will visit the main shrine, the Dharmarajka Stupa and the Dhamekh Stupa, the spot where he first espoused the teachings that were to form the very principles of the Buddhist faith. We will also see the nearby Ashoka Pillar and the monastery, the centre pieces of what is in effect probably the most expansive collection of Buddhist temples and monasteries on earth. At its height this remarkable site housed over 1500 monks, before its decline and subsequent destruction by Muslim armies saw it all but disappear. It was rediscovered by British archaeologists in the middle years of the 19th century, since which it has recaptured some of its original prestige and now represents one of the four holiest Buddhist sites on earth. Returning to Varanasi after our visit we will spend the afternoon exploring the old city and the riverfront by cycle rickshaw and on foot, before an evening sunset boat ride along the sacred Ganges itself, hopefully catching sight of the local priests performing the revered Aarti ceremonies. Varanasi can boast some 80 or so riverfront ghats, including a number of 'burning ghats' where public cremations take place along the water's edge. It is possible this morning to take an optional dawn boat ride along the Ganges, when the city is bathed in the glow of the early morning and the pilgrims are practising the puja ceremony to the newly awaking sun. The rest of the day is free to explore more of this most fascinating of cities at your leisure, immersing yourself in the eclectic mayhem of the city's narrow streets and alleyways, a truly unforgettable experience and an incredible insight into the lives and cultures of traditional Indian life. Late this afternoon we will transfer back to the railway station for the overnight sleeper train to Agra. Once the capital of the mighty Mughal Empire, the city is littered with some of the country's most opulent and iconic buildings, and the sandstone majesty of its imposing fort is no exception. Built by Emperor Akbar and then embellished by his grandson, Shah Jahan, the fort was once a great city, with palaces, mosques and halls all lying behind the protective embrace of 20m high walls. There will be some free time to wander the city, perhaps taking in the rich elegance of the exquisite Itimad-ud-Daulah, a 17th century tomb built for the Emperor Jehangir's chief minister that mirrors the marble majesty of the more famous Taj Mahal (hence its rather apt title of 'Baby Taj). This afternoon we will visit the nearby abandoned city of Fatehpur Sikri, lying to the west of Agra and, for a brief time, the capital of the Mughals under Akbar the Great. Founded in 1569 it was deserted just 16 years later following the emperor's death and today it remains a ghostly testament to the majesty and power of 16th century Mughal India. Visiting the site with a local guide we take in the splendour of its perfectly preserved imperial court and the grandeur of the 5-storey Panch Mahal. We will also see the courtyard and pachisi board, where the emperor played an Indian equivalent of chess, using slave girls as pieces. Perhaps the finest of all the city's monuments though is the lotus shaped carved central pillar of the Diwan-i- Khas (Hall of Private Audience), a magnificently column of matchless proportions that supports the vaulted roof of Akbar's old debating room. This morning we have an early start as we head for the iconic magnificence of one of the most universally recognised buildings on earth, and surely the greatest testament to love ever constructed. Built by the emperor Shah Jahan to honour the memory of his beloved wife Mumtaz, the building took some 22 years to complete and was once described by Rudyard Kipling as 'the embodiment of all things pure'. Built of marble and decorated with the most exquisite inlay work, the Taj Mahal required the labour of 20,000 men and is estimated to have cost something in the region of 3 million rupees (at today's prices that equates to around $70 million). In the afternoon we travel to Delhi. This morning we explore the colonial grandeur of New Delhi. The Indian capital has long been a phoenix, rising again and again out of its own ruins and is essentially a city divided in two: a magnificent living monument to the grandiose designs of the Moghals and the British. New Delhi was the creation of the British Raj of the 1930s and its streets are filled with a rich collection of the architectural creations of Edward Lutyens. Our tour this afternoon will include many of the sites of New Delhi and give us the opportunity to see for ourselves this vibrant city of bustling bazaars and historic sites. Following the broad expanse of the Rajpath (Kingsway), we will visit the towering memorial arch of the India Gate, a testament to the 90,000 Indian troops who lost their lives during WWI and the fighting along the Northwest Frontier during the early years of the 20th century. We will view the imposing buildings of the Indian Parliament, as well as the Moghal majesty of Humayun's Tomb, a 16th century mausoleum commissioned by the emperor's Persian born wife and considered by many to be one of the best examples of Moghal architecture in the country. We also visit the towering Qutub Minar, a spectacular 13th century edifice made of sandstone and marble that towers some 73m above the city and heralded the final demise of the Hindu kings and the arrival of the Muslim sultans. After lunch we take a tour of Old Delhi by metro and cycle rickshaw. This old city, the former capital of the 17th century Mughal emperor Shan Jahan, is a magnificent fusion of grandiose architecture and vibrant chaos, centred around the Chandni Chowk Bazaar, an eclectic cacophony of noise, colour and deafening barter that is so essentially Indian. Our sightseeing takes in the spectacular Jama Masjid Mosque, the largest in India and Shah Jahan's magnificent swansong. Taking 14 years to complete, the mosque is a majestic structure, featuring four towers, three gateways and two towering minarets that stand some 40m high. Built from sandstone and marble its vast courtyard can hold upwards of 25,000 worshippers and from the top of the southern minaret you can get a clear view of the colonial designs of Edward Lutyens across the city. Departing the Indian capital this morning we take a train to Kalka, just to the north of Chandigarh. From here we transfer to a narrow gauge track and continue to Shimla on the remarkable 'Toy Train'. Climbing from the plains below, the train negotiates a meandering journey of some 93km, ascending over 1600m towards the cooling heights of the old British hill station. Whilst traditionally the Toy Train was pulled by steam engines these days they are mostly pulled by diesel engines. The journey takes us through an incredible 103 tunnels and past some of the most scenic landscapes in the region, before reaching the town itself, stretched out along a crescent shaped ridge, its alpine style houses shaded beneath dense forests of fir. With a full day in Shimla we have an opportunity to explore this beautiful setting further, first with an orientation tour of the town, taking in some of its colonial ambience. The opening of the Kalka-Shimla railway at the turn of the 20th century allowed the well to do families of the Raj to escape the heat of Kolkata and Delhi and spend the hot summer months amongst the cool landscapes of these verdant hills. We will take in the ageing charm of the Christ Church and Scandal Point, where the mock Tudor architecture presents a quite surreal imitation of Old England against the magnificent backdrop of the Himalaya. Whilst following the ridge there is an opportunity to visit the Viceregal Lodge, the former residence of the British viceroy and site of a number of important negotiations that preceded Indian independence. A free day for personal exploration in Shimla. Various optional walks are also available today, such as the 2km walk up to the Jakhu or 'monkey' Temple, which provides some inspiring panoramic views. Dedicated to the monkey god Hanuman the site is, as you might imagine, inundated with monkeys, many who find no trouble in chancing their arm at mischief and mayhem, so be careful of bags, food and anything that isn't firmly nailed down! Back in town, the bazaar is renowned for its selection of locally made woollen shawls, as well as a range of other locally produced handicrafts. Departing Shimla this morning we follow the train track as it winds its way down towards the town of Ambala, to connect with an afternoon train to Amritsar in the Northern Punjab. The holiest city of the Sikhs', Amritsar was founded in 1577 and, in spite of extremist unrest and destructive invaders, it remains the spiritual centre of the Sikh religion, its magnificent Golden Temple acting as a serene centrepiece. After transferring to the hotel there may be an opportunity to visit this landmark monument this evening, to watch the reflective light of the moon playing across the tranquil waters that surround the main shrine, the Harmandir. The temple is home to the revered texts of the Sikh Holy Scriptures, the Guru Granth Sahib, and its gilded dome is covered in over 700kg of pure gold. A sumptuous fusion of Hindu and Islamic influences, the temple was the scene of the massacre of hundreds of Sikh protesters in 1984, when the Indian army acting on the orders of the then Prime Minister Indira Gandhi, evicted extremists from the temple, an act that led to the assassination of Indira Ghandi by Sikh bodyguards later that same year. Today we visit the incredible Golden Temple where we need to make sure that we remove our shoes, cover heads and wash our feet before entering. The temple itself is a surprisingly small building surrounded almost entirely by tanks of holy water in which the Sikh pilgrims bathe (the name of the town itself comes from the Amrit Sarovar - the Pool of Nectar). The atmosphere is one of incredible calm, with devotees taking their turn to pass through the main shrine, where there is a continuous and melodic recital (known as the Akhand Path) from the Guru Granth Sahib. This afternoon there will be an excursion to Wagah Border to see the 'Flag Down' ceremony, where the border guards for both India and Pakistan make a rather dramatic display of closing the border gates each day. In general only lightweight clothing is needed during the day, but bring warmer clothing for the winter evenings from mid November to mid February, (especially in December and January) when a windproof jacket, several warm layers, gloves and hat are also recommended. Hotel heating arrangements are not on a par with UK standards and from December to February thermals are also recommended. Local people may be offended by western styles of dress and brief shorts tight fitting clothing etc. should be avoided by both men and women. One main piece of baggage and a daypack. Please remember, you are expected to carry your own luggage so don't overload yourself. You may also find a holdall or a rucksack easier to get on and off train with, rather than a hard case. A torch, water bottle, good quality sunglasses, insect repellent and high factor sunscreen are all essential. You may also find binoculars a bonus. 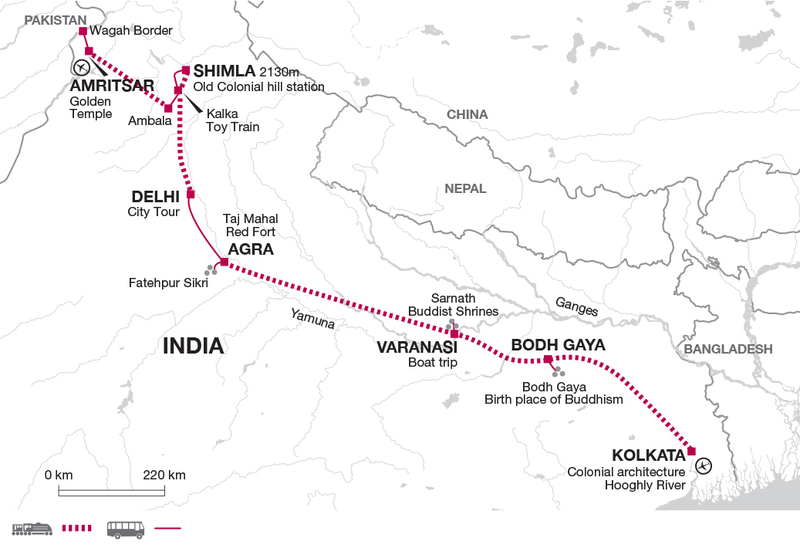 This tour is ideal for anyone wanting to experience India's fantastic rail network. Travelling mainly by train it's a great opportunity to mix with local families and really get under the skin of the country.